It's that time of year when some seriously nice knits hit the shops. And I think this is one of them. From Topshop, it's part slouchy, part dressy, care of the embellished Peter Pan collar and is the perfect Autumn jumper - light enough to stop you feeling suffocated and yet warm enough to insulate you against chilly air. It is described as a grey "sweat" top on the site and that's the right description. It feels so comfortable to wear but I think looks quite pretty too. I got this when I was in the UK, wore it three times in one week. Now I wear it when exposed to severe air-conditioning in an attempt to "cosy". I absolutely love the collar detail, it's intricate and has a touch of quality about it. I think that Topshop knitwear can sometimes be a big miss but this actually washes well - collar and all - but lets see how long it takes before the Bobble Factor takes over. I really love this time of year. Wardrobe wise I always find there is a frisson of excitement in buying a winter coat and cosy jumpers. I think it reminds me of that whole "Back to School" shopping extravaganza that I used to partake in. I can't wait to show you some work-related dresses that I picked up in Debenhams (I am wearing them all next week for an industry event and in an attempt to get enthusiastic about endless networking I incentivised myself by buying new clothes :) and some other bits in American Eagle. Beauty wise I focussed on my hair and got two new items I am excited to try. 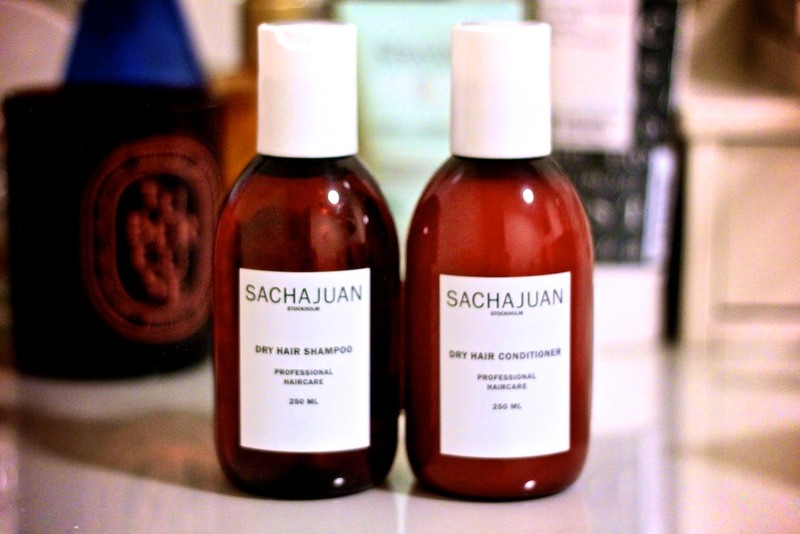 I have run out of shampoo and conditioner and so thought it was now time to try the famed Sacha Juan line. They are a Swedish brand with a clean design aesthetic to match their roots. Their packaging is so neat...I find that oddly inspiring. What wardrobe must-haves do you have your eye on this coming season? I love that coat! If I had to buy one that would be it! really loved this post. at the moment i'm obsessed with my sweater by glamorous (the one i linked you to a few days ago). it's a pretty studded charcoal number that i can't wait to wear to death, if and when the weather gets colder, as it's been ridiculously warm lately!!! I love the simple packaging of those products. I know its silly but I like the more plain looks its makes me think the product is more authentic somehow! I've never heard of that shampoo and conditioner. Good luck with it and keep us posted. I really like the Garcon jumper and the Darling dress you've featured. I'm currently swooning over the Officer coat and the Sheepskin Biker Jacket from Gerard Darel. Looking forward to seeing what you got from the mall! I love those items too....need to check out Gerard Darel I know that they have revamped this season. Now I am intrigued! Lovely jumper and those trousers are super cute. I love buying AW clothes. The collar on this jumper is lovely. I do that line of hair care, the conditioner transformed my super long thick hair. You only need a really small amount or hello grease!! Enjoy!! I live in Sweden and alas, am not impressed with Sacha Juan at all... (Have normal to dry hair. :)) But hopefully the formula suits your hair better! As usual I absolutely love your taste! That Garcon jumper is dreamy. 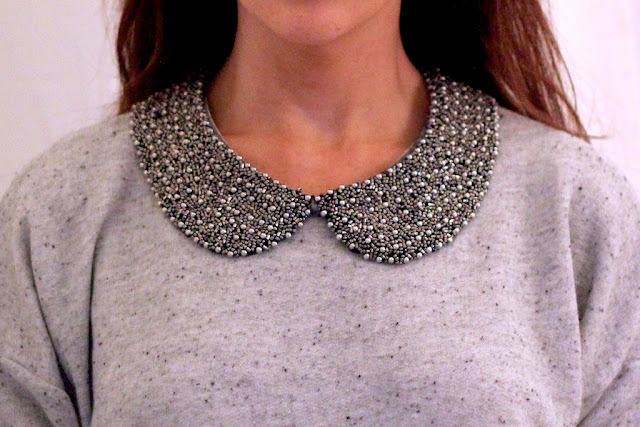 Finally a fresh take on the peter pan collar! All those white on floral shirts are starting to get quite boring. :) Glad you like - Topshop did well ! I'm totally in love with the BERRY FULL SKIRTED COAT!! i love it, no stock!! oh no!!! love that jumper, just purchased it myself! love how its slouchy, looks comfy yet stylish! eee :) Hope you love it :) Agree with you on the slouch factor - it just feels right. Adore your jumper, I bought a gorgeous Topshop jumper too, they've got some fab styles in right now! I love the jumper, specially the collar! I love peter pan collars and this one is gorgeous! That Garcon Sweater is totally great! I love it. You are always too stylish! Thanks :) And yes, me too! As far as I am concerned this is a trend that will never die! I think it's cute and slightly vintage at the same time. LOVE! Amazing post, please let us know how the shampoo and conditioner goes because I'm really interested in trying it. I can't wait to see what you think of the shampoo and conditioner, they look fab! I love the bottles they come in, they're similar to the Trilogy cleanser I love! It's boots for me .. mostly looking at cute ankle boots in suede. I seem to be obsessed with suede this year. i adore the grey sweater and asos dahlia dress - what a gorgeous colour! I love it too - I think it's such a pretty dress! Love the jumper. I have such a love hate relationship with jumpers. I fell huge in jumpers but love, like you, the cosiness of jumpers. I think it is said to buy jumpers a size to big for you...is this true?...if so maybe that is where I am going wrong. The miracle for hair is Aésop Rose Moisturising Mask! Try it Laura, it's truly incredible! Haha! I'm actually wearing an (old) Topshop jumper as I'm reading this and can't help laughing as I look at all the bobbles on my jumper!! Hope yours wears better than mine! I agree completely :) love them! Love the coats a lot! Thanks for sharing! Greetings from Munich! this post was just genius. i love your style and love every post. xo. great outfit! so simple but chic and pretty! very nice!! and it reduce the humidity within your home to eliminate the 'stickiness' . where humidity can be reduced without over-cooling the room. WOW... I love MyDeals247 model - they create competition among the sellers real-time. I found the best prices at MyDeals247 - nothing can beat that. Thanks for sharing. Actually, Central air conditioner is one of the most effective and efficient ways to circulate cool air throughout the house. It's biggest benefit is that individual window units cannot claim. One of the best ideas to come along in a very long time is the idea of solar air conditioning. Simplicity itself, hvac repair lewisboro system has nonetheless been overlooked for far too long. As the technology of this system grows, the popularity of it will also spread.